Not to be confused with long-term depression, a neurophysiological process in the brain. Run on the Fourth National Bank, No. 20 Nassau Street, New York City, 1873. From Frank Leslie's Illustrated Newspaper, October 4, 1873. In 1873, during a decline in the value of silver—exacerbated by the end of the German Empire's production of thaler coins—the US government passed the Coinage Act of 1873 in April. This essentially ended the bimetallic standard of the United States, forcing it for the first time onto a pure gold standard. This measure, referred to by its opponents as "the Crime of 1873" and the topic of William Jennings Bryan's Cross of Gold speech in 1896, forced a contraction of the money supply in the United States. It also drove down silver prices further, even as new silver mines were being established in Nevada, which stimulated mining investment but increased supply as demand was falling. Silver miners arrived at US mints, unaware of the ban on production of silver coins, only to find their product no longer welcome. By September, the US economy was in a crisis, deflation causing banking panics and destabilizing business investment, climaxing in the Panic of 1873. Some have argued the depression was rooted in the 1870 Franco-Prussian War that hurt the French economy and, under the Treaty of Frankfurt, forced that country to make large war reparations payments to Germany. The primary cause of the price depression in the United States was the tight monetary policy that the United States followed to get back to the gold standard after the Civil War. The U.S. government was taking money out of circulation to achieve this goal, therefore there was less available money to facilitate trade. Because of this monetary policy the price of silver started to fall causing considerable losses of asset values; by most accounts, after 1879 production was growing, thus further putting downward pressure on prices due to increased industrial productivity, trade and competition. In the US the speculative nature of financing due to both the greenback, which was paper currency issued to pay for the Civil War and rampant fraud in the building of the Union Pacific Railway up to 1869 culminated in the Credit Mobilier panic. Railway overbuilding and weak markets collapsed the bubble in 1873. Both the Union Pacific and the Northern Pacific lines were central to the collapse; another railway bubble was the railway mania in the United Kingdom. Because of the Panic of 1873, governments depegged their currencies, to save money. The demonetization of silver by European and North American governments in the early 1870s was certainly a contributing factor. The US Coinage Act of 1873 was met with great opposition by farmers and miners, as silver was seen as more of a monetary benefit to rural areas than to banks in big cities. In addition, there were US citizens who advocated the continuance of government-issued fiat money ( United States Notes) to avoid deflation and promote exports. The western US states were outraged— Nevada, Colorado, and Idaho were huge silver producers with productive mines, and for a few years mining abated. Resumption of silver dollar coinage was authorized by the Bland-Allison Act of 1878. The resumption of the US government buying silver was enacted in 1890 with the Sherman Silver Purchase Act. Monetarists believe that the 1873 depression was caused by shortages of gold that undermined the gold standard, and that the 1848 California Gold Rush, 1886 Witwatersrand Gold Rush in South Africa and the 1896–99 Klondike Gold Rush helped alleviate such crises. Other analyses have pointed to developmental surges (see Kondratiev wave), theorizing that the Second Industrial Revolution was causing large shifts in the economies of many states, imposing transition costs, which may also have played a role in causing the depression. Like the later Great Depression, the Long Depression affected different countries at different times, at different rates, and some countries accomplished rapid growth over certain periods. Globally, however, the 1870s, 1880s, and 1890s were a period of falling price levels and rates of economic growth significantly below the periods preceding and following. — Anibal Pinto, president of Chile, 1878. 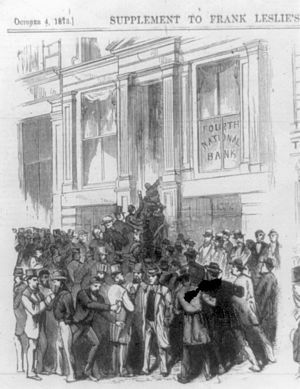 The 1878 failure of the City of Glasgow Bank in Scotland arose through a combination of fraud and speculative investments in Australian and New Zealand companies (agriculture and mining) and in American railroads. Building on an 1870 reform, and the 1879 famine, thousands of Irish tenant farmers affected by depressed producer prices and high rents launched the Land War in 1879, which resulted in the reforming Irish Land Acts. In the United States, beginning in 1878, the rebuilding, extending, and refinancing of the western railways, commensurate with the wholesale giveaway of water, timber, fish, minerals in what had previously been Indian territory, characterized a rising market. This led to the expansion of markets and industry, together with the robber barons of railroad owners, which culminated in the genteel 1880s and 1890s. The Gilded Age was the outcome for the few rich. The cycle repeated itself with the Panic of 1893, another huge market crash. David Ames Wells (1890) wrote of the technological advancements during the period 1870–90, which included the Long Depression. Wells gives an account of the changes in the world economy transitioning into the Second Industrial Revolution in which he documents changes in trade, such as triple expansion steam shipping, railroads, the effect of the international telegraph network and the opening of the Suez Canal. Wells gives numerous examples of productivity increases in various industries and discusses the problems of excess capacity and market saturation. The economic changes that have occurred during the last quarter of a century - or during the present generation of living men - have unquestionably been more important and more varied than during any period of the world's history. Some of these changes have been destructive, and all of them have inevitably occasioned, and for a long time yet will continue to occasion, great disturbances in old methods, and entail losses of capital and changes in occupation on the part of individuals. And yet the world wonders, and commissions of great states inquire, without coming to definite conclusions, why trade and industry in recent years has been universally and abnormally disturbed and depressed. Wells notes that many of the government inquires on the "depression of prices" (deflation) found various reasons such as the scarcity of gold and silver. Wells showed that the US money supply actually grew over the period of the deflation. Wells noted that deflation lowered the cost of only goods that benefited from improved methods of manufacturing and transportation. Goods produced by craftsmen and many services did not decrease in value, and the cost of labor actually increased. Also, deflation did not occur in countries that did not have modern manufacturing, transportation, and communications. Nobel laureate economist Milton Friedman, author of A Monetary History of the United States, on the other hand, blamed this prolonged economic crisis on the imposition of a new gold standard, part of which he referred to by its traditional name, The Crime of 1873. This forced shift into a currency whose supply was limited by nature, unable to expand with demand, caused a series of economic and monetary contractions that plagued the entire period of the Long Depression. Murray Rothbard, in his book History of Money and Banking of the United States, argues that the long depression was only a misunderstood recession since real wages and production were actually increasing throughout the period. Like Friedman, he attributes falling prices to the resumption of a deflationary gold standard in the U.S. after the Civil War. Other economic historians have complained about the characterization of this period as a "depression" because of conflicting economic statistics that cast doubt on this interpretation. They note it saw a relatively large expansion of industry, of railroads, of physical output, of net national product, and of real per capita income. As economists Milton Friedman and Anna J. Schwartz have noted, the decade from 1869 to 1879 saw a growth of 3 percent per year in money national product, an outstanding real national product growth of 6.8 percent per year, and a rise of 4.5 percent per year in real product per capita. Even the alleged "monetary contraction" never took place, the money supply increasing by 2.7 percent per year. From 1873 through 1878, before another spurt of monetary expansion, the total supply of bank money rose from $1.964 billion to $2.221 billion, a rise of 13.1 percent, or 2.6 percent per year. In short, it was a modest but definite rise, not a contraction. 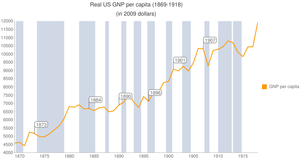 Although per-capita nominal income declined very gradually from 1873 to 1879, that decline was more than offset by a gradual increase over the course of the next 17 years. Accompanying the overall growth in real prosperity was a marked shift in consumption from necessities to luxuries: by 1885, "more houses were being built, twice as much tea was being consumed, and even the working classes were eating imported meat, oranges, and dairy produce in quantities unprecedented". The change in working class incomes and tastes was symbolized by "the spectacular development of the department store and the chain store". Wikimedia Commons has media related to Long Depression. What actually constitutes the Long Depression has been debatable, for at first it was called the Great Depression, and then that title was transferred to the 1930s. Consequently, some limit the term Long Depression to the worldwide price recession beginning in 1873 and running through the spring of 1879. Six years is not exactly a "long" depression, that in our analysis is 26 years – the typical maximum period which Japan entered following 1989.95. Europe appears to be completing a 13-year depression from 2007 into 2020 thanks to austerity – deliberate deflation to support bondholders. ^ Rosenberg, Hans (1943). "Political and Social Consequences of the Great Depression of 1873-1896 in Central Europe". The Economic History Review. 13. Blackwell Publishing (1/2): 58–73. doi: 10.1111/j.1468-0289.1943.tb01613.x. JSTOR 2590515. ^ Musson, A.E. (1959). "The Great Depression in Britain, 1873-1896: A Reappraisal". The Journal of Economic History. Cambridge University Press. 19 (2): 199–228. JSTOR 2114975. ^ Capie, Forrest; Wood, Geoffrey (1997). "Great Depression of 1873–1896". In Glasner, David; Cooley, Thomas F. Business cycles and depressions: an encyclopedia. New York: Garland Publishing. pp. 148–49. ISBN 0-8240-0944-4. ^ a b "Business Cycle Expansions and Contractions". National Bureau of Economic Research. Retrieved January 4, 2009. ^ Fels, Rendigs (1949). "The Long-Wave Depression, 1873-97". The Review of Economics and Statistics. The MIT Press. 31 (1): 69–73. doi: 10.2307/1927196. JSTOR 1927196. ^ a b c d e f g h i j k David Glasner, Thomas F. Cooley (1997). "Crisis of 1873". Business Cycles and Depressions: An Encyclopedia. Taylor & Francis. ISBN 0-8240-0944-4. ^ * Loomis, Noel M. (1968). Wells Fargo. pp. 219–220, 224–225. ^ a b Ron Chernow (1998). Titan. New York: Vintage Books. p. 160. ISBN 1-4000-7730-3. ^ a b Eric Hobsbawm (1989). The Age of Empire (1875–1914). New York: Vintage Books. p. 35. ISBN 0-679-72175-4. ^ a b c d Eric Hobsbawm (1989). The Age of Empire (1875-1914). New York: Vintage Books. p. 36. ISBN 0-679-72175-4. ^ a b Eric Foner (2002). Reconstruction: America's unfinished revolution, 1863–1877. HarperCollins. p. 535. ISBN 0-06-093716-5. ^ Eric Hobsbawm (1989). The Age of Empire (1875–1914). New York: Vintage Books. p. 37. ISBN 0-679-72175-4. ^ Andrew Tylecote (1993). The long wave in the world economy. Routledge. p. 12. ISBN 0-415-03690-9. ^ Paul Kennedy (1989). The Rise and Fall of the Great Powers. Fontana Press. p. 219. ^ a b France and the Economic development of Europe (1800-1914). Routledge. 2000. p. 320. ISBN 0-415-19011-8. ^ a b c d e Historia contemporánea de Chile III. La economía: mercados empresarios y trabajadores. 2002. Gabriel Salazar and Julio Pinto. p. 25-29. ^ Salazar & Pinto 2002, pp. 25-29. ^ a b c France and the Economic development of Europe (1800-1914). Routledge. 2000. pp. 70–71. ISBN 0-415-19011-8. ^ a b c d e f g h i j David Glasner, Thomas F. Cooley (1997). "Depression of 1882–1885". Business Cycles and Depressions: An Encyclopedia. Taylor & Francis. ISBN 0-8240-0944-4. ^ France and the Economic development of Europe (1800-1914). Routledge. 2000. pp. 198–199. ISBN 0-415-19011-8. ^ a b France and the Economic development of Europe (1800-1914). Routledge. 2000. p. 457. ISBN 0-415-19011-8. ^ David Glasner, Thomas F. Cooley (1997). "Business cycles in Russia (1700–1914)". Business Cycles and Depressions: An Encyclopedia. Taylor & Francis. ISBN 0-8240-0944-4. ^ a b c d e f g h David Glasner, Thomas F. Cooley (1997). "Depression of 1873–1879". Business Cycles and Depressions: An Encyclopedia. Taylor & Francis. ISBN 0-8240-0944-4. ^ Fels, Rendigs (1949). "The Long-Wave Depression, 1873-79". The Review of Economics and Statistics. 31 (1): 69–73. doi: 10.2307/1927196. JSTOR 1927196. ^ "United States Census" (PDF). Retrieved 2010-07-19. If the census figures are accurate, it is 17.83 percent. ^ a b c d Philip Mark Katz (1998). Appomattox to Montmartre: Americans and the Paris Commune. Harvard University Press. p. 167. ISBN 0-674-32348-3. ^ The Cambridge Economic History of the United States. Cambridge University Press. 2000. p. 223. ISBN 0-521-55307-5. ^ a b Eric Foner (2002). Reconstruction: America's unfinished revolution, 1863-1877. HarperCollins. pp. 531–532. ISBN 0-06-093716-5. ^ France and the Economic development of Europe (1800-1914). Routledge. 2000. pp. 38–39. ISBN 0-415-19011-8. ^ a b France and the Economic development of Europe (1800-1914). Routledge. 2000. p. 39. ISBN 0-415-19011-8. ^ a b France and the Economic development of Europe (1800-1914). Routledge. 2000. p. 40. ISBN 0-415-19011-8. ^ The Reader's companion to American history. Houghton Mifflin Harcourt. 1991. ISBN 0-395-51372-3. ^ Eric Hobsbawm (1989). The Age of Empire (1875-1914). New York: Vintage Books. p. 50. ISBN 0-679-72175-4. ^ a b Eric Foner (2002). Reconstruction: America's unfinished revolution, 1863-1877. HarperCollins. p. 522. ISBN 0-06-093716-5. ^ McCabe, James Dabney; Edward Winslow Martin (1877). The History of the Great Riots: The Strikes and Riots on the Various Railroads of the United States and in the Mining Regions Together with a Full History of the Molly Maguires. ^ Eric Hobsbawm (1989). The Age of Empire (1875-1914). New York: Vintage Books. p. 45. ISBN 0-679-72175-4. ^ Hannah Arendt (1973). The Origins of Totalitarianism. Houghton Mifflin Harcourt. p. 137. ISBN 0-15-670153-7. ^ Fels, Rendigs (1951). "American Business Cycles, 1865–79". The American Economic Review. American Economic Association. 41 (3): 325–349. JSTOR 1802106. ^ Davis, Joseph (2006). "An Improved Annual Chronology of U.S.; Business Cycles since the 1790s". The Journal of Economic History. 66 (1): 103–21. doi: 10.1017/s0022050706000040. ^ David Glasner, Thomas F. Cooley (1997). "Debt-deflation theory". Business Cycles and Depressions: An Encyclopedia. Taylor & Francis. ISBN 0-8240-0944-4. ^ Friedman, Schwartz. A Monetary History of the United States: 1867–1960. ^ a b Murray N. Rothbard. "A History of Money and Banking in the United States: The Colonial Era to World War II" (pdf), The War of 1812 and its Aftermath, p.145, 153-156. ^ George Selgin. "Less Than Zero - The Case for a Falling Price Level in a Growing Economy", The Institute of Economic Affairs, 1997, p.49-53. Referenced 2011-01-15. Samuel Bernstein, "American Labor in the Long Depression, 1873–1878," Science and Society, vol. 20, no. 1 (Winter 1956), pp. 59–83. In JSTOR.